All weighed up for an MTL attempt. redefined_cycles wrote: All weighed up for an MTL attempt. That'a how I fit mine when I use it too. It stops loads more crap being flung up in to my face. Not bivvying but have given myself a target limit of 42lb fully packed whoch would include the shelter and sleeping bag on the forks in the 160ish grams Gorilla Cages. Also water wouldn't be as much and hopefully look at filling up at running water spots. Excuse my ignorance but, what is MTLing?! It's a loop on the Pennine bridleway I think. How did you find having the bladder in the frame bag? Main thing having its pack aswell was to get the weight up to fully packed targets. So when the shelter/S bag needs to go on bike, water can go on back. I made a sort of cradle for mine [ resting on bags and between the Gap in some alpkit confusius bars ] using some additional straps for it to rest n and secure it. Lazarus wrote: I made a sort of cradle for mine [ resting on bags and between the Gap in some alpkit confusius bars ] using some additional straps for it to rest n and secure it. I tried a similar tactic with a camelbak unbottle a year or so ago. Discounted it as it Puts a heavy lump in an a less than ideal place which I'm sure affected the handling of the bike and also lurched about when the terrain got lively! Its sub optimal solution [ though i have toyed with putting it one of those lightweight runner camelbaks [ which i have as it was cheaper than the bladder alone] as i think you can secure that more easily - but you may as well then just put in on your back anyway - it was so hot i wanted no bag. Only a heatwave will make me consider this again. Just done an extreme honesty weigh in and I'm a little shocked. So this set up is for B150 next month and a test run tomorrow. This includes absolutely everything I think will start on my bike. 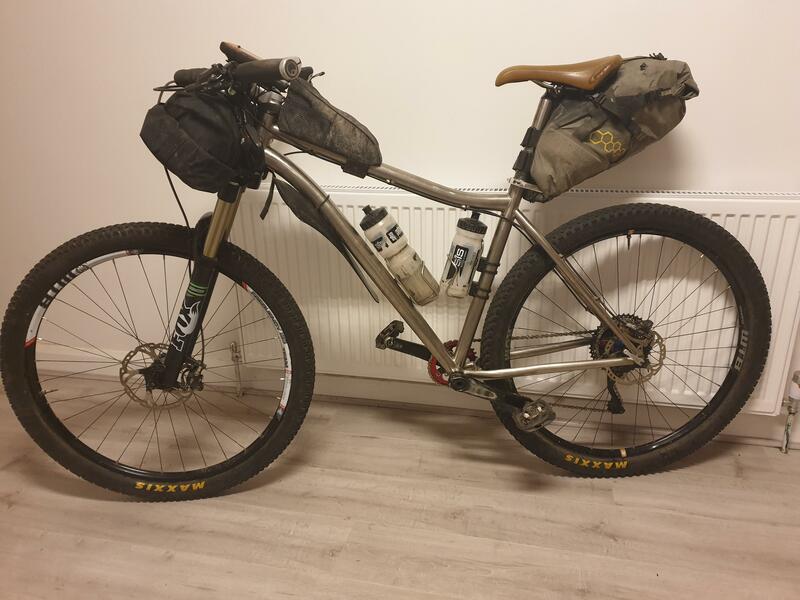 IncludesGPS and spare batts, all food I'll start with, water, tools, lights, waterproofs, spare warm gear, emergency bivi. Salsa Fargo Rohloff - all steel with Nano's. Guess I could loose a few tools and layers but I wouldn't want to. Guess I could lighten up the bike but I won't be affording a Ti Fargo anytime soon. Suppose the stuff you usually avoid counting in an all up weight adds up more than you like to think. 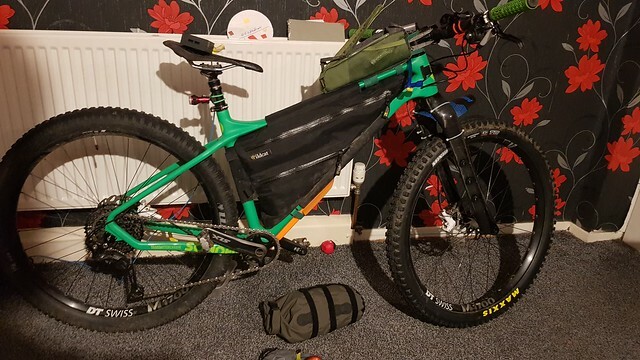 Weighed my full-sus (not my usual bikepacking bike) loaded for the Lakeland 200 on Friday - 19.5kg. Rucksack was a further 3kg with no water (a full bladder would bring it up to 5). Need to weight the bike unloaded to see how much is kit, but the spec weight for a small (mine's XL) is 13.4.kg, though I've changed a few small bits. I think (I.e. I can't remember) that my bike at last year's WRT was 18kg. That was a Salsa Spearfish which is 12.5kg plus the gear that I intended to use on the HT550 later that month plus whatever food I'd stuffed in the stem cells. The list of actual items is quite long but packed it doesn't look a lot. 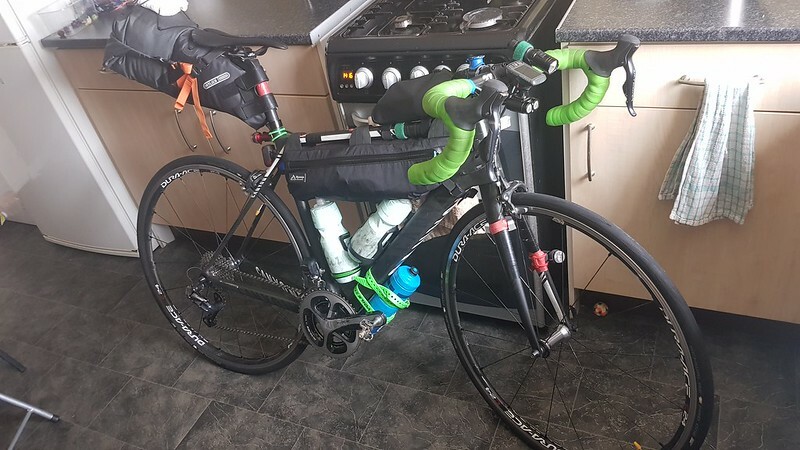 My bike, kit, food and water for the 2017 B150 came to 22.4kg or 49.5lb in old money. That was everything apart from the clothes I was wearing I even took a tarp and poles. This year I'd hope to have a lighter setup. 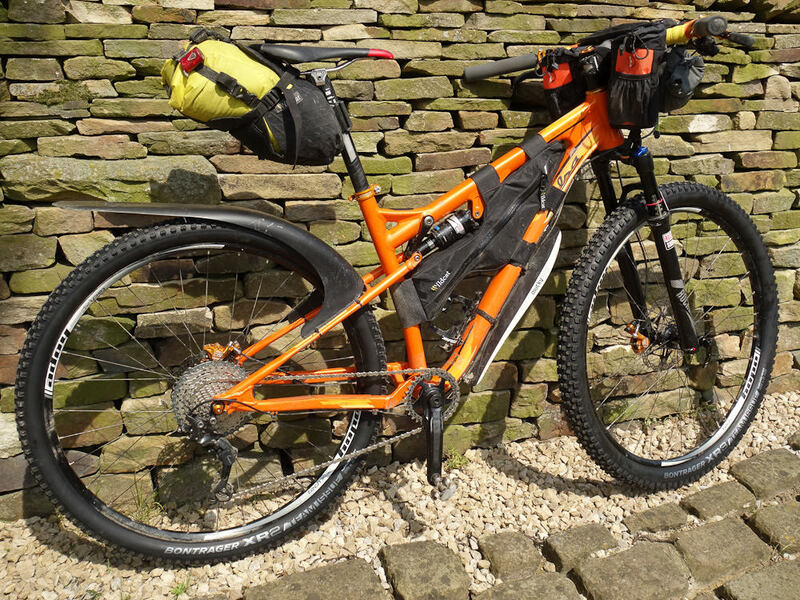 21.5kg ready for the Dales Divide. Probably the heaviest I've ever packed - more water and food (a lot more food tbf) then I'd usually take. It's still not alot of gear though is it? Most DofE kids carry that on their back and they don't even have a bike! Being picky but did you weigh in with the bottles full? Because they look empty in your pic Full, they'd be 1.5kg and that's about 8% of your weight right there.